"He sits patiently in the queue good as gold. It'll be person, person, person, cat, person, person." Another English cat with a mind all his own has created quite a sensation by riding public transportation all by his lonesome. 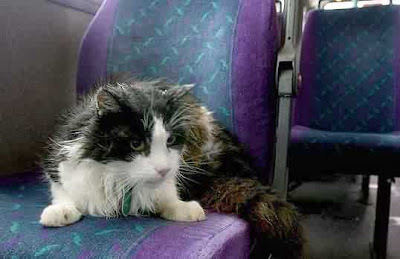 This time around it is a twelve-year-old longhaired tuxedo named Casper who has been taking excursion tours around the Devon city of Plymouth for the past four years. Each day at promptly 10:55 a.m., he lines up outside his house with other commuters in order to take First Bus's number three line on a one-hour, eleven-mile jaunt around town. "He sits patiently in the queue good as gold," his guardian, sixty-five-year-old care giver Susan Finden, told The Sun on July 30th. (See "I've Got a Bus Puss.") "It'll be person, person, person, cat, person, person." His gregarious nature also could factor into the equation somewhere. "He does love people, and I don't know what the attraction is but he loves big vehicles like lorries and buses," she told the BBC on July 29th. 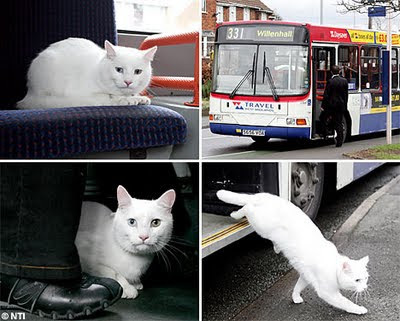 (See "Commuter Cat Is Star of Bus Route.") A video also accompanies this article. Once on board, Casper generally keeps pretty much to himself. "He usually just curls up at the back of the bus," driver Rob Stonehouse (of no known connection to the red light district) told the Daily Telegraph in the article cited supra. "Sometimes he nips between people's legs but he never causes any trouble." For their part, the drivers watch out for him and make sure that he gets off at the right stop. Perhaps even more amazingly, the petit fait that he has traveled an estimated twenty-thousand miles without ever once feeding the farebox does not seem to trouble either the drivers or management one bit. 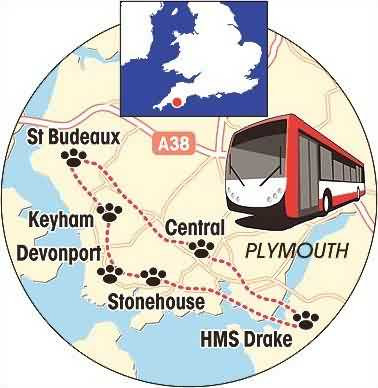 "We wouldn't sell a cat a Rover ticket," a spokesman for First Bus told The Sun. "But in cat years he's an OAP (Old Age Pensioner) so he'd get a free bus pass anyway." That is definitely true because in human terms Casper is the equivalent of sixty-four-years-old. Actually, First Bus has a reputation of being kindly disposed toward cats. For instance, back on February 10th driver Peter Whiting stopped in the rain and picked up a nameless black cat with white paws that had been hit by a motorist and left for dead on Fakenham Road in the Taverham section of Norwich. Once on board, he and several other concerned passengers cared for it as best as they could under the circumstances. Later, commuter Jo Laker took the cat to a veterinary hospital where it was diagnosed to have suffered a broken jaw, concussion, and possibly brain damage. It was, thankfully, expected to live. Like his fictional namesake from out of the pages of T. S. Eliot's immortal Old Possum's Book of Practical Cats, Macavity is a mysterious cat. First of all, no one is quite sure where he lives or who owns him. Even his real name is a secret. Perhaps even more intriguing is how he gets home at night since he only rides one-way. The one thing that is not in dispute, however, is his gentlemanly manners. "I suppose he is the perfect passenger really," fellow commuter Paul Brennan told the Daily Mail on April 9, 2007. 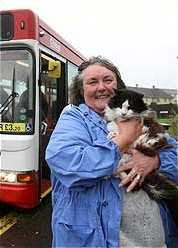 (See "Mystery Cat Takes Regular Bus to the Shops.") "He sits quietly, minds his own business, and then gets off." Although Tony Blair and his cronies did their level best to transform Old Blighty into a police state, it is refreshing that, at least outside of London, the country maintains enough of its old quaintness that cats are still welcome on its buses. Photos: The Sun (Casper, map, and Finden) and Daily Mail (Macavity).